Comfort Dog Handlers are a special breed in themselves. They have a love for dogs and the people they serve. Comfort Dog Handlers are passionate, and they take their responsibilities seriously. It becomes a way of life, and its hard to separate these behaviors when not handling a dog. 10. They always have a lint roller on them. 8. They are always looking for a photographic opportunity. 7. They have “poop” bags in one pocket and Dog Business Cards in the other. 5. They carry a small squeaky toy in their pocket, and have used it during family photographs. 3. They smile at strangers. 2. They are used to being greeted last on Sunday mornings. 1. They have hearts as big as the sky, and often drop everything to visit the suffering and lonely on a minutes’ notice. Do you know a Comfort Dog Handler or are you one? If so, what qualities do they have? Leave a comment, below. We would love to hear from you. I’d say that L.C.C. 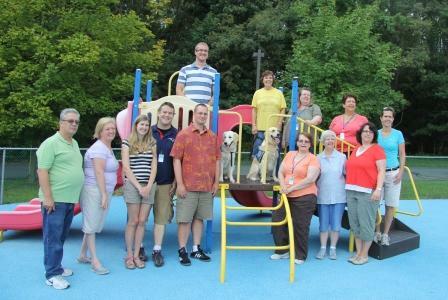 Comfort Dog handlers are people who one could look to, and see, what it means, as a Christian, to be merciful, a good neighbor, and a good citizen. I like your web-site Lily and wish you (and your people) a Merry Christmas and a Happy New year. Extremely clever and extremely beautiful, Lily! A handler has added an extra memory card to a smart phone because of all the pictures that have been taken. A Comfort Dog handler stops at all doorways with or without a leash in hand. A Comfort Dog handler always checks for a nice grassy area before entering a building. One other thing…..they are indespensible.